Low-slung, with mournful eyes, legs as curved as a Parker Knoll armchair, ears boasting the wingspan of a B-52 and a sonorous Barry White voice, the basset, the Boris Johnson of the dog world, has been charming (and exasperating) discerning dog owners for centuries. That ludicrously cuddly exterior conceals a keen nose, second only in scenting ability to a bloodhound, and if he gets a whiff of a rabbit, the last you’ll see of him is the white tip of his tail. Their fans are legion-and lofty. Shakespeare surely had bassets in mind when Theseus describes his pack in A Midsummer Night’s Dream: ‘Their heads are hung/With ears that sweep away the morning dew/Crook-knee’d and dew-lapt like Thessalian bulls/Slow in pursuit, but matcht in mouth like bells.’ Hippolyta agrees, declaring: ‘I never heard/So musical a discord, such sweet thunder.’ Strangely, neither mention ‘slobber’d jowls’ or ‘be-muddi’d bellies’, just two of the hazards of basset ownership. My own basset Wellington’s foibles include extreme possessiveness of what he considers to be ‘his’ things, whether a smelly bone or a cashmere scarf liberated from the pocket of a Barbour. Exchange or bribery, I’ve learnt, work better than confrontation. He sulks if told off, retreating to his basket and grumbling loudly. His vocal range includes sighing, moaning, chatting and, if a walk or food is imminent, belching. a friendlier place when you have one around. ‘They’re relatively unusual and people always want to speak to them,’ she says. ‘But they’re out to please themselves, not their owners. If you throw a ball, they’ll look at you as if to say “you threw it, you go and get it”.’ Miss Jeffers currently has two in the house, Midge and Thatcher, and 20 in kennels. Sigmund (so called ‘because he spent so much time on the couch’), who belonged to artist Tony Roberts, once disgraced himself before an important meeting. ‘My agent was coming for lunch and I’d spent the morning preparing shish kebabs,’ recalls Mr Roberts. ‘Somehow, Sigmund managed to climb onto the kitchen table, and I returned from answering the telephone to find him standing there, having gorged himself on 3lb of minced lamb, garlic, chilli and spices. The wooden skewers had been rejected and carefully set aside.’ This didn’t deter Mr Roberts, who has clocked up more than 40 years of basset ownership, and now has Pablo and Nico (kennel name Culdaws Bayleaf), a Crufts winner last year. The basset’s gargantuan appetite, like his appearance, has its roots in a hunting heritage. Reputedly first bred by monks in France (the breed name derives from bas, meaning low) to hunt in thick cover, bassets gained popularity outside the aristocracy because you didn’t need a horse to keep up with them. They are, however, capable of pursuing their natural quarry, the hare (rabbit since the hunting ban), over great distances, so it was important to have a hound that had a good appetite and was able to keep the weight on. Those comical short legs keep the nose close to the ground, and the long ears and wrinkles trap scent, making them extremely effective hunters. Mr Valentine fell for the breed as a young boy, on hearing the ‘sweet thunder’ articulated so beautifully by Shakespeare. ‘That first day, hounds put up a hare and went off with a crash of music,’ he recalls. ‘The cry of hounds just does something for me. I love standing in a field listening to them going off like a peel of bells.’ When you’ve heard a pack of bassets, says Mr Valentine, other hounds seem deficient. Early breed devotees included Everett Millais (son of the Pre-Raphaelite painter), Lord Onslow, Lord Galway and, later, Queen Alexandra, who kept both smooth and rough-coated dogs at Sandringham-most UK bloodlines can be traced back to her stock. Millais carried out breeding experiments to introduce new blood, with an outcross to a bloodhound, which resulted in the heavier-boned type. For many years, there was scant division between hunting and show bassets; the Albany was set up to be the working arm of the Basset Hound Club-registered with the Kennel Club (KC)-to foster the hunting instinct in every basset. But showing people began to favour the heavier hound, adopted as the breed standard in the 1960s, and there was eventually an acrimonious split with the hunting faction. Alison Jeffers recalls that the Albany was once a ‘bit of a joke’ in hunting circles. ‘People would bring their pet bassets [to hunt] and there were so many different physical capabilities in the pack, they would be strung out over a couple of miles.’ The Albany began to outcross its KC-registered hounds with hunting bassets to put back ‘the drive and verve’, and split from the Basset Hound Club in 2002. Its members have no regrets. ‘By that stage, showing bassets were so cumbersome, with so much wrinkled skin, they just waddled around the huntsman’s feet,’ says Miss Jeffers. 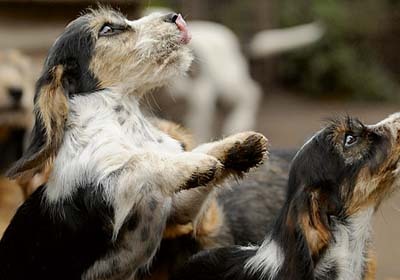 ‘Now, our hounds cover 20-25 miles in the afternoon and you could throw a blanket over them, they’re so close.’ In 2008, show-ring bassets were described as ‘deformed, congenital dwarves’ in the controversial BBC One documentary Pedigree Dogs Exposed. The KC has since updated the breed standard, to ensure the basset is ‘fit for purpose’ and ‘capable of great endurance in the field’. Skin must not be wrinkled to an ‘excessive’ degree, nor ears ‘excessively’ long, and there must be ‘adequate clearance’ between the body and the ground. Adverse publicity might help to explain why numbers have declined since the breed’s heyday in the 1960s, when the Fred Basset cartoon began appearing in newspapers and celebrities such as Brigitte Bardot, Marilyn Monroe (hers was called Hugo), Clint Eastwood (Sidney) and Rex Harrison (Homer) owned them. On television, the detective Columbo had a basset named Dog and the sheriff in The Dukes of Hazzard had one called Flash. There was another spike in popularity in 1988, when a basset called Jason fronted the Hush Puppies advertising campaign, but numbers have since fallen-last year, fewer than 1,000 basset puppies were registered with the KC. It’s the fifth most popular dog in the hound group (the whippet came top at 3,295), but these are low numbers compared to the gundog and terrier groups. that one.’ And a previous De Burgh huntsman was mortified at the Essex County Show when bassets ‘rampaged through the WI tent, sampling cakes on the way’.